It’s a national holiday here today, so I decided to play truant (read: child and its mother whined at me until I agreed to leave the house). Stopped off at Battlesbridge during the day’s travels to get Lili some new riding gear: left them in the shop and walked to the water. This is the River Crouch, at lowish tide. I should have taken a shot of the sailing barge that was moored next to me, because it occurs to me that not everyone’s seen a classic east coast sailing barge, but the two grim old people sitting by its wheel glaring at me over their mugs of tea kind of dissuaded me. You don’t mess around with barge folk. Unless you want a boat ’ook up yer bum. In centuries past, of course, the Crouch and particularly its eastern tributary, the Roach, were pirate waterways. Smugglers, in the middle of the night, carefully angling their agile boats down the creeks they grew up around and knew like the lines in their own salt-hard palms, away from the big Inland Revenue cutters crewed by strangers in uniforms. This was their territory, their water. And there’s been generations of mine, too, standing here by the water’s edge, with a cigarette in their hand, watching the Crouch go by. When I stand here, I’m standing with my dad, and my grandad. Nothing between us but years. And you learn, after a while, that years mean nothing at all. 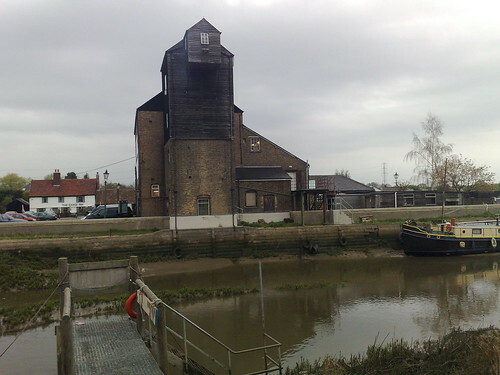 “Crouch” “Foulness Island”, which came first the names or the depression diagnosis? Seriously, I love when you write about English history and terrain. You have elements of Nelson Algren writing about Chicago and touches of Iain Sinclair exploring London. I seem to remember some action in the Baroque Cycle set here. Lovely little piece, thanks for sharing. Nice bit of writing, that, and very affecting. Sometimes looking inward is more valuable than looking out, or to the future. Sickeningly gorgeous. Warren Ellis, you break my heart. It all led up to that wonderful last paragraph. A gem. Excellent all the way around, and great photo. You should play truant more often. :) Thank you for letting us stand at the water’s edge with you and history. And you learn, after a while, that years mean nothing at all…..